If new pools are permitted, city water czar Joshua Haggmark wonders whether residents will really buy into the conservation effort. Staring into the abyss of the fourth year of the worst drought in California’s recorded history, the Santa Barbara City Council declared a Stage III emergency and upped the conservation ante from a 20 percent reduction to 25 percent. Under an executive edict just issued by Governor Jerry Brown, the city was ordered to achieve a 16 percent reduction in water consumption or face fines up to $10,000 a day, though that threat is moot. With conservation hovering around 22 percent, Santa Barbara is the most conserving city per capita anywhere in Southern California and the fourth best in the state. Californians statewide managed to cut back water consumption by only 8.6 percent over the past 10 months. News of this distinction elicited some “We’re the best” giddiness from several councilmembers, but not for long; the facts of the drought are too sobering. For the first time ever, Lake Cachuma will deliver no new water as of October 1. There’s also less available water in the dam than previously estimated, and subscribing water agencies will have to make do with even less than the reduced allocation ​— ​45 percent ​— ​for which they’d been bracing. With additional deliveries of state water iffy at best, Goleta Water District is poised to push the Stage III button, enact drought-inspired rate increases, and impose new mandatory conservation measures. Farmers on the western edge of the district ​— ​cut off from the pipes and pumps needed to deliver water ​— ​are scrambling to secure tree-stumping buyouts from the district. Without so much as batting an eyelash, Santa Barbara’s City Council approved the first of $2.1 million in studies required to secure the necessary state permits to reactivate its desalination plant. (Contract negotiations are currently underway between a desal plant operator and City Hall in hopes of getting 3,125 acre-feet of water a year online by fall 2017.) The council also voted to ban drilling new private wells within city boundaries or restoring existing ones. Desperate times may call for desperate measures but also weirdly incongruous debates. In addition to the Stage III declaration, city staff proposed several high-profile restrictions that would achieve only modest reductions in use. Included was a ban on new pool construction, with water czar Joshua Haggmark explaining it was hard to ask residents to conserve when they saw new pools and fountains going in. This sparked a well-orchestrated counterattack by the pool and spa industry, whose members gave the council a serious earful. “If the pools start to go, the implications are colossal,” said one. Others insisted that a pool-sized lawn, even a drought-tolerant one, needed far more water than a pool requires. Councilmember Gregg Hart said the water saved by such a ban ​— ​there are roughly 14 new pools a year ​— ​constituted only 0.001 percent of the city’s water supply. By contrast, he noted, City Hall could save 1,100 acre-feet a year by banning lawn irrigation, a moratorium that would be very much in play if conservation measures do not pan out, he said. 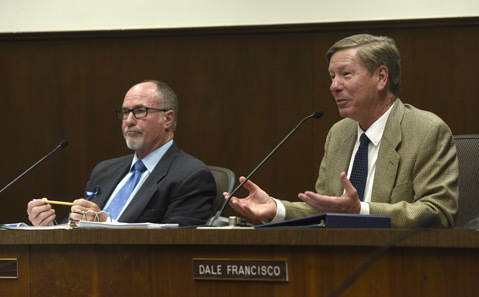 Until then, argued councilmembers Hart, Randy Rowse, and Dale Francisco, small symbolic gestures were counterproductive. Mayor Helene Schneider, who expressed zero appetite for a pool ban, was in favor of requiring water-saving landscaping at new developments. Likewise, she liked a proposal to limit washing cars on commercial car lots to once a week, saying such measures sent valuable messages to the community. Ultimately, the council agreed to punt on imposing restrictions until the governor’s executive edict is released later this week. Whatever Gov. Brown includes, the council will support. Anything else will be debated later. Only two speakers advocated more aggressive conservation. 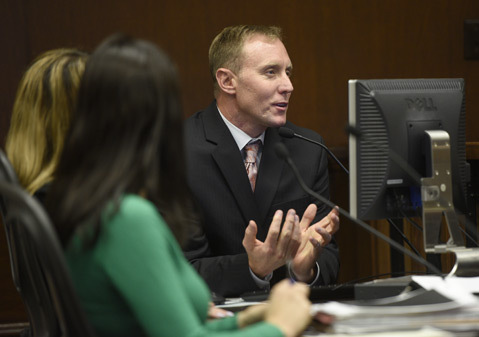 Milt Hess was blistering in his condemnation of City Hall’s response to the drought. “I am furious,” he declared, “This report is self-satisfied pap. We need to do so much better than the weak, incremental measures proposed.” Using publicly available records, Hess found his East Los Olivos Street neighbors used six times more water than he did. City Hall projects it will lose $5 million in water sales by conserving 25 percent. When the new water rates ​— ​to pay for the desal plant ​— ​go into effect in July, city water customers are expected to experience profound sticker shock, and high water rates remain the single most efficient deterrent to water use.